Barry and Annette Lett Funeral Directors are a locally owned and operated family business. We have been caring for families since our commencement in 1995. Our facilities enable us to provide a caring environment in which to arrange a highly personalised funeral service. Barry and Bradley Lett, along with their qualified and courteous staff, pride themselves in offering care, compassion and service with dignity for the people of Gippsland. In February 2013 we mourned the loss of Annette Lett, after a two year battle with cancer. She will be remembered for her dedication to caring for the people of Gippsland. 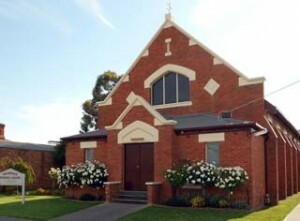 Delbridge Funeral Chapel in Marley Street, Sale. As AFDA members we are bound by a strict code of Ethics and Code of Conduct designed to meet both community needs and expectation in all aspects of service delivery. The Code is a reassurance to the community of sincere care and professional service, particularly at a time of uncertainty and distress for grieving family and relatives.